I’m back into the swing of things after taking last week off for some much needed R & R. I really need to do that more often, I think! 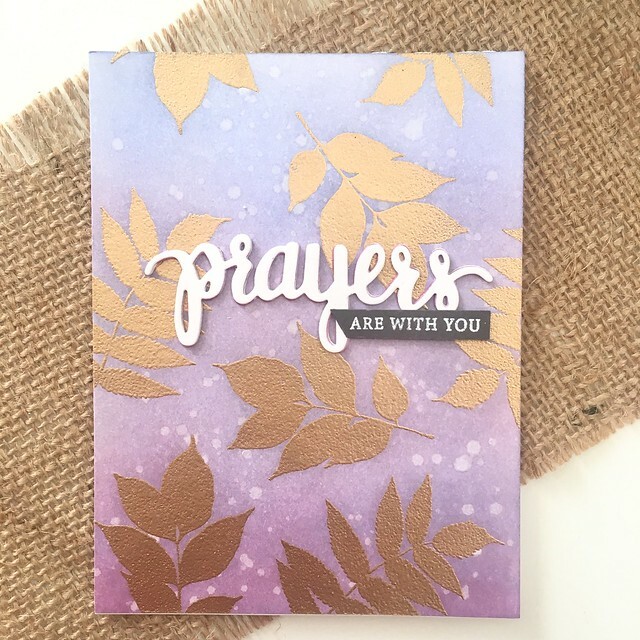 Today I’m sharing a sympathy card that was inspired by this one, made by May Park. 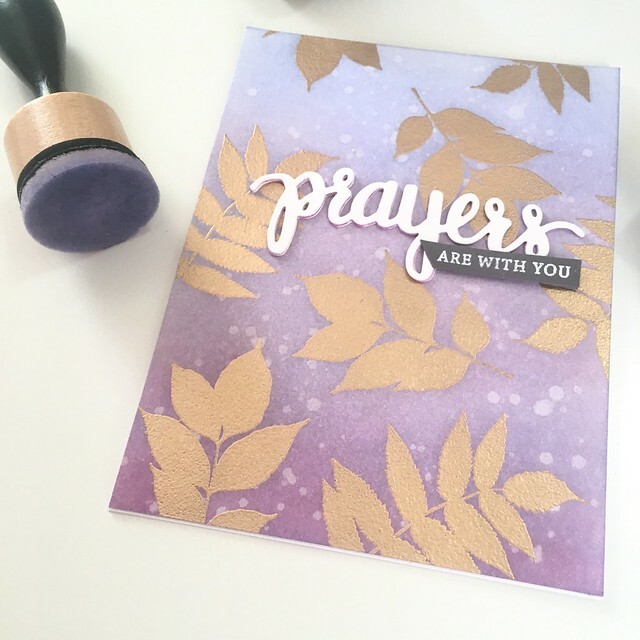 Just as she did, I stamped some floral images (using the Autumn Leaves stamp set) and embossed them with gold embossing powder. 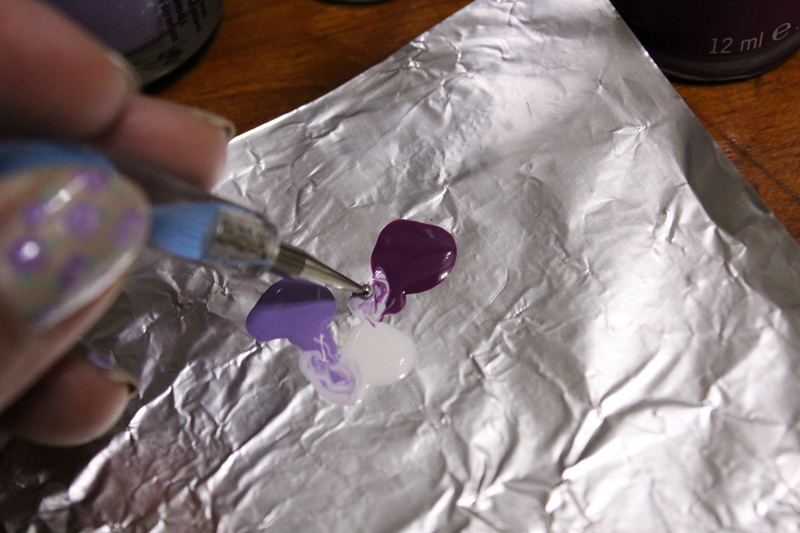 I then blended on some Shaded Lilac, Milled Lavender, and Seedless Preserves distress ink. I added some spatters of water to give the panel a bit more interest. 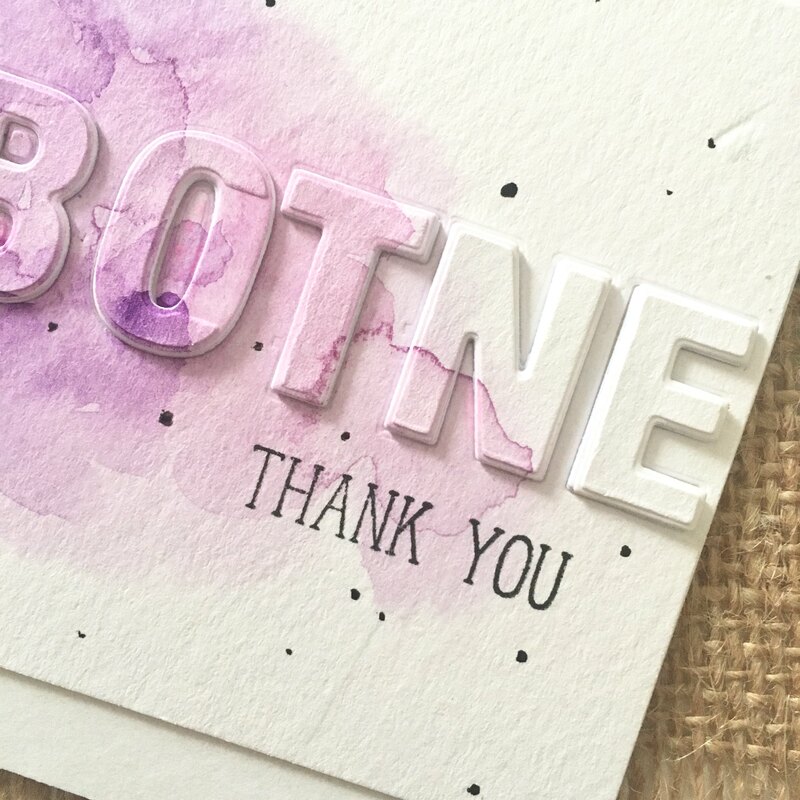 I kept the main sentiment white and embossed the rest onto some slate gray card stock. 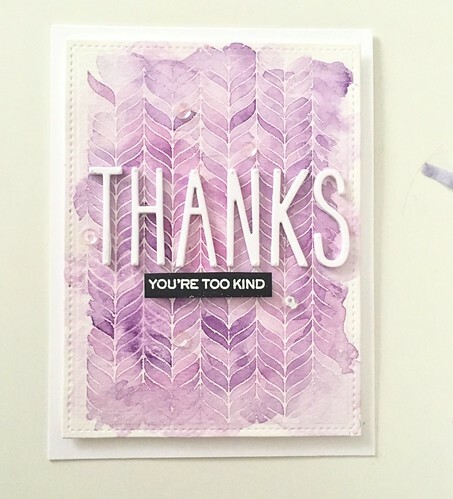 The stamp & die set I used for the sentiment is from Hero Arts. As usual, these kinds of cards are not my favorite to make, but this one turned out pretty (and would be a fabulous design for many other types of cards, too!). What are you guys making this week? Hi! 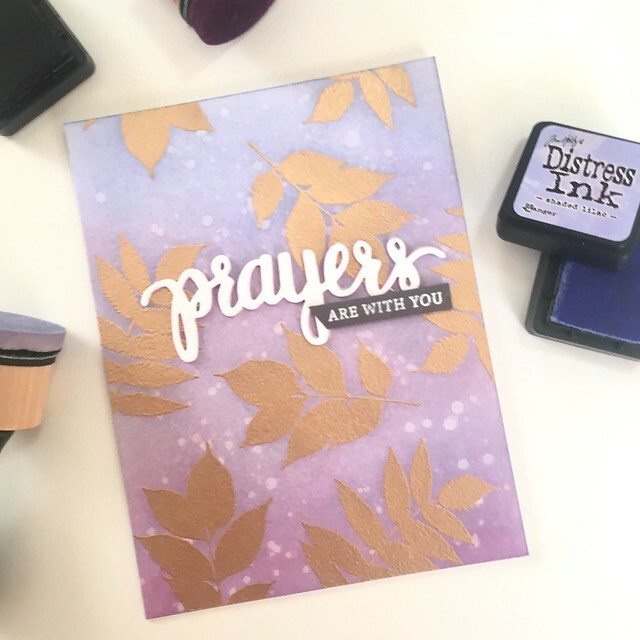 Sharing a quick card I made several weeks ago, using emboss resist, this background stamp, watercolors, Journaling Alpha dies and a sub sentiment from this Wplus9 set. 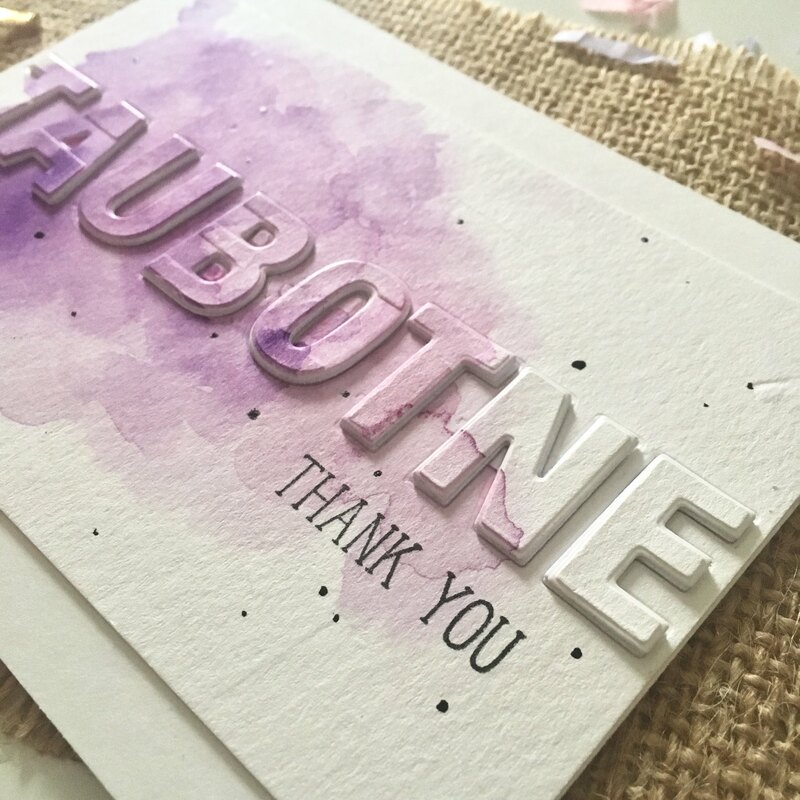 Simple cards with pretty watercolor washes make my heart happy! 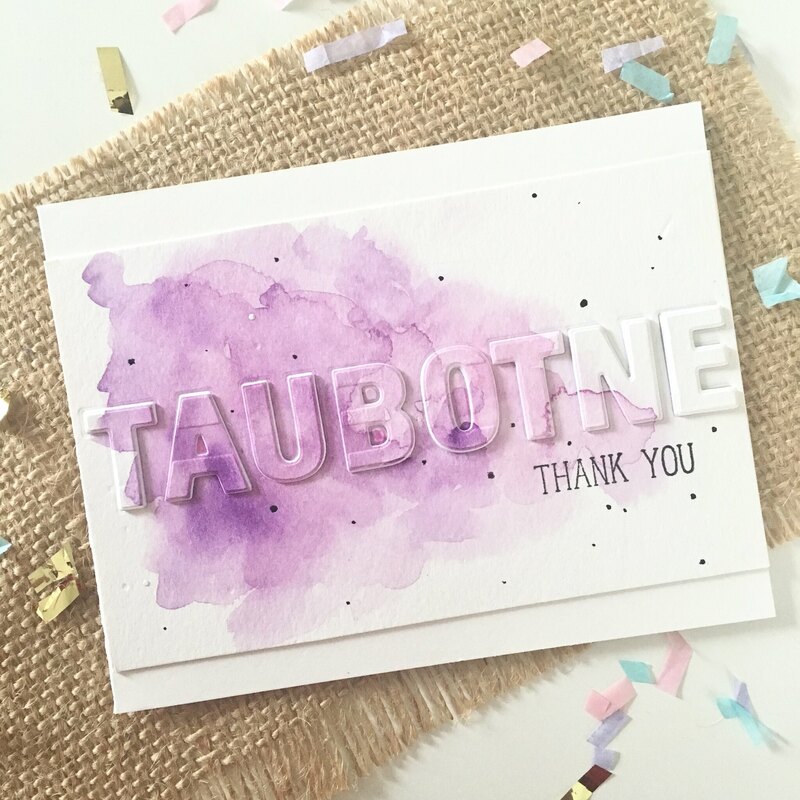 Just a quick post today to share with you this one-layer thank you card I put together. I fell in love with this card I made not too long ago, and used that as inspiration for this one. 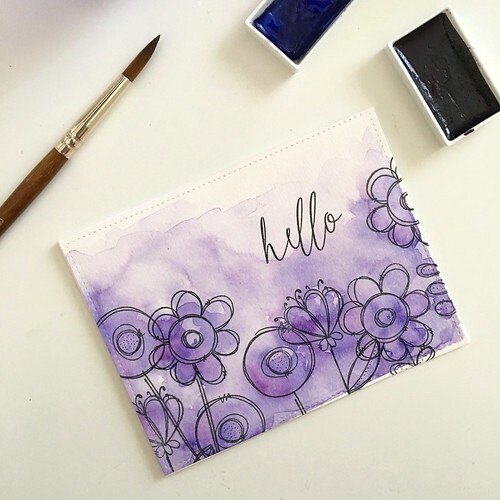 I used the outline flower image from the Beautiful Day stamp set and some masking paper, to create a focal point of layered flowers at the bottom right of my watercolor panel. I then added a whole lot of pink and purple-toned watercolor in several layers. I made sure that the highest saturation of color was focused on the flowers themselves, but that was about as fussy as I got with it. 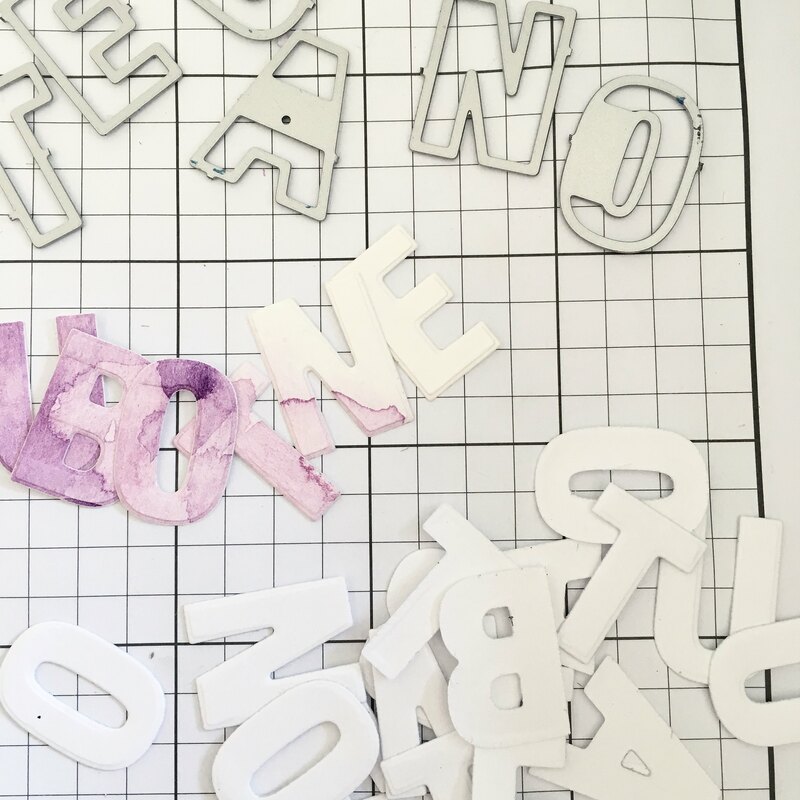 When the panel was dry, I cut it down to 4.25″ x 5″ size using a stitched rectangle die. 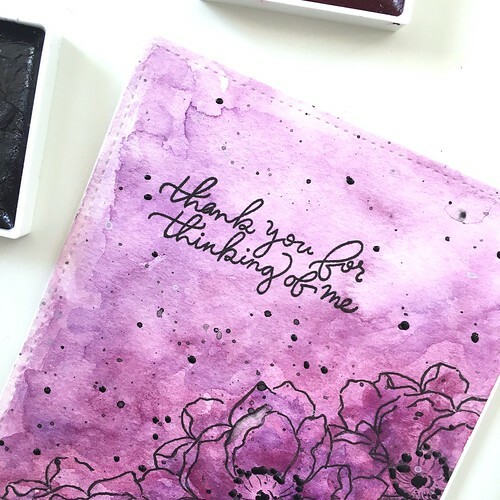 Then, I stamped my sentiment from the SSS Handwritten Floral Greetings set using Intense Black Ink (I also used this ink for stamping the flowers because it’s waterproof). 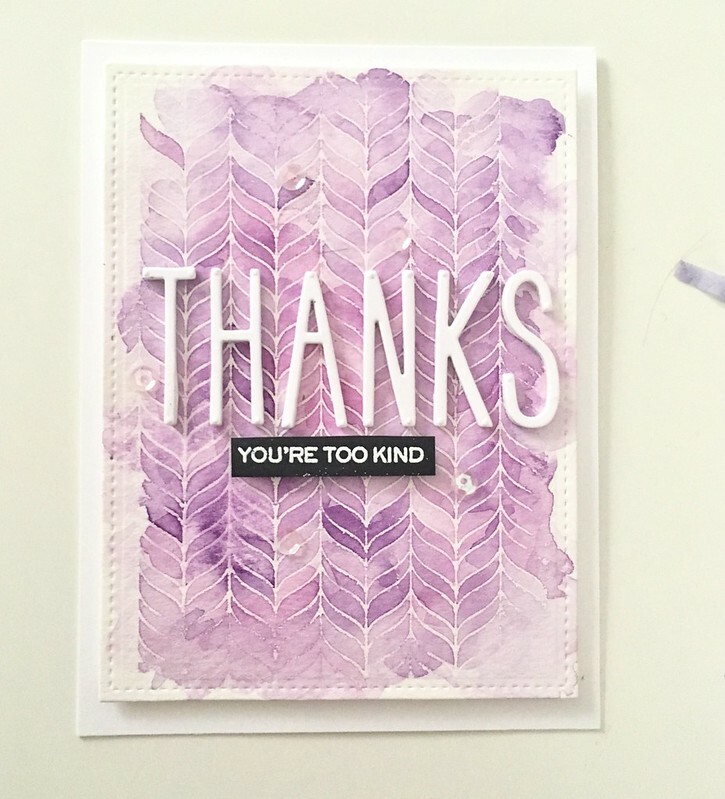 At this point I realized I need to add a little somethin’ somethin’ to the card, so I masked off my sentiment and added some black ink splatters here and there. 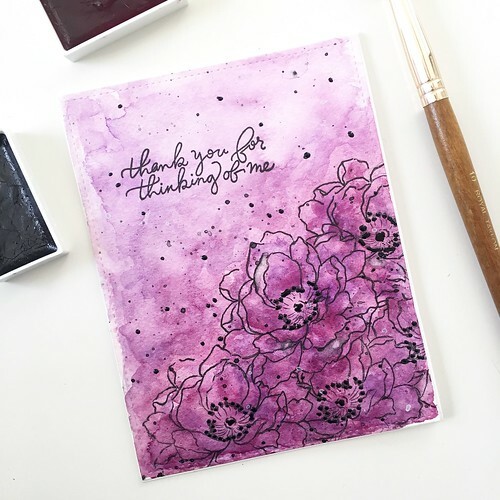 I also used my Pico Embellisher in black to add some life back to the flower centers, which had gotten lost underneath all of the watercolor. I hope everyone’s week is off to a wonderful start! 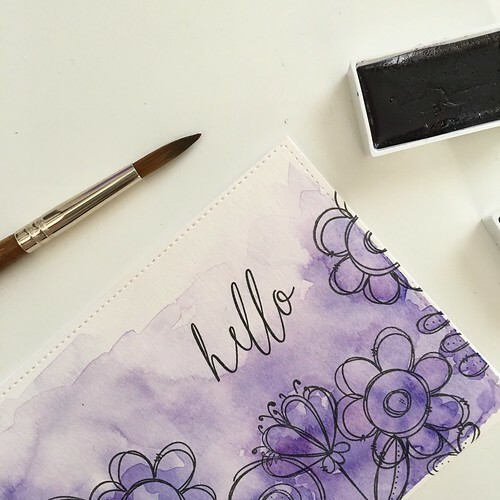 It seemed to me that the first post after the name change should be a watercolor one, and I’ve had some requests to show a bit more of my water coloring process, too. 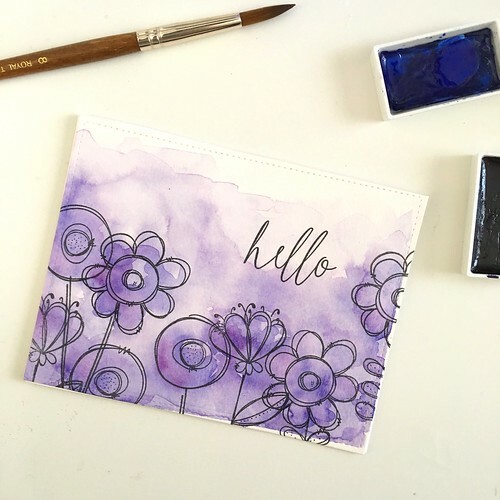 I thought the best way to do that was to make another of my most favorite doodle buds watercolor cards and to capture a bit of the process in a video! I followed the same technique that I outlined in my previous post, stamping multiple images from the doodle buds set onto Canson Watercolor Paper and not worrying about making them off before I layered images on top of each other. Then I got out my Gansai Tambi watercolors. ….And I basically had no idea what I was doing, which made me feel very un-hip! It took me quite a while to snip and rotate and condense everything into a video that is about one minute long. I also sped up the video quite a bit, to fit the bulk of the painting process in. And then I inadvertently ended up with a YouTube channel so that I could share the video here. Phew. Overall, I had fun making the video and I’m sure the whole process will get much less frustrating if I have a bit more practice. 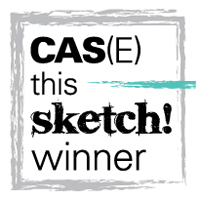 Anyway, I hope you enjoy it! 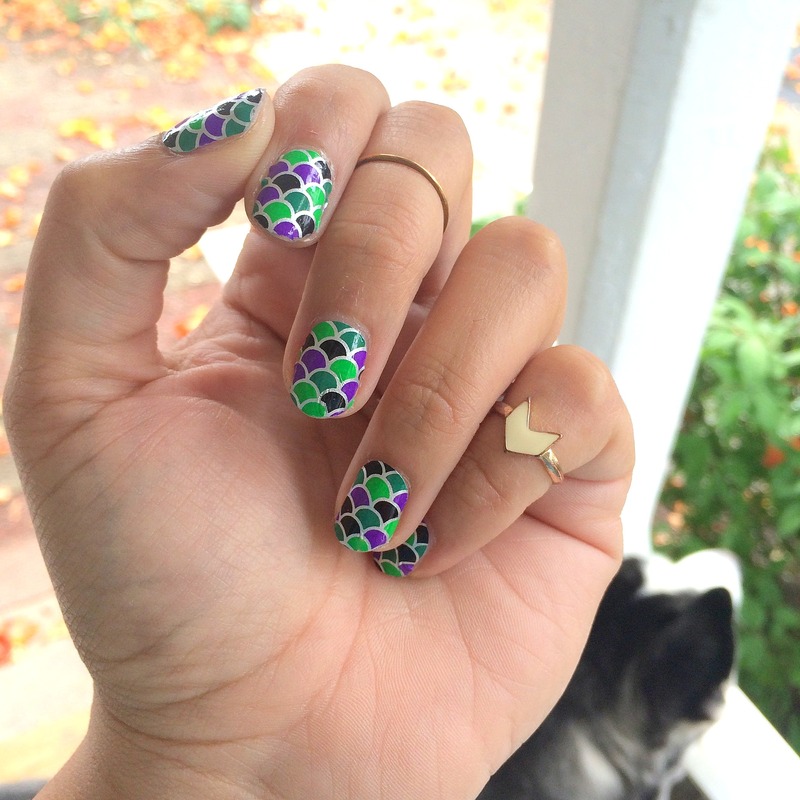 I recently discovered this really great nail wrap company called Scratch. 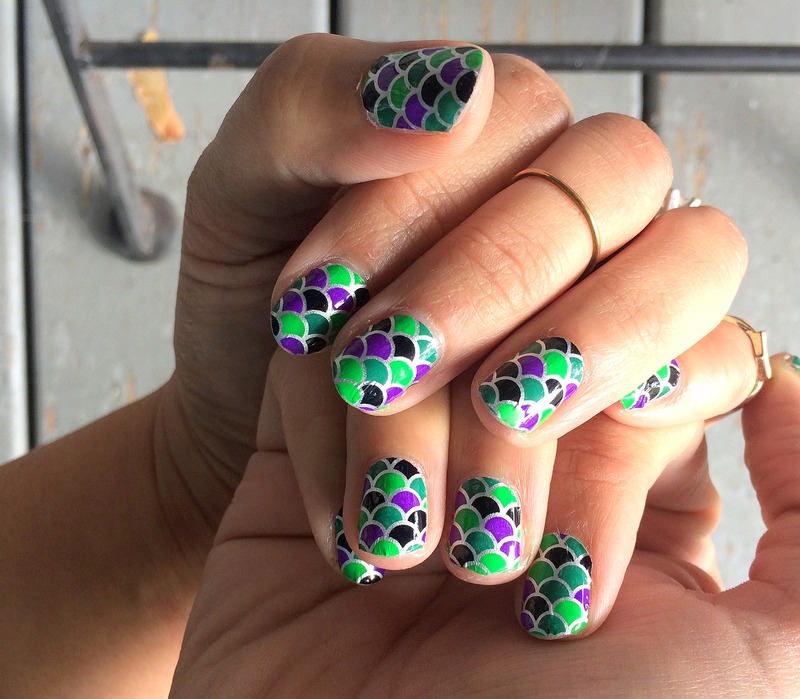 The company partners with different artists each month, who design nail wraps that are almost always incredible. You can buy the wraps individually, or you can subscribe for a monthly mani box, which is what I decided to do (mostly because I wanted all the wraps ever). What’s nice about the monthly service is that you have the option to skip months if you decide that the featured designs just aren’t for you. I’m waring the Dragon’s Den wraps that were a part of the October mani box. I love how fun and colorful these are. Even though these were part of a monthly box, you can still buy them individually from the Scratch website, too! p.s. This post was not sponsored in any way. 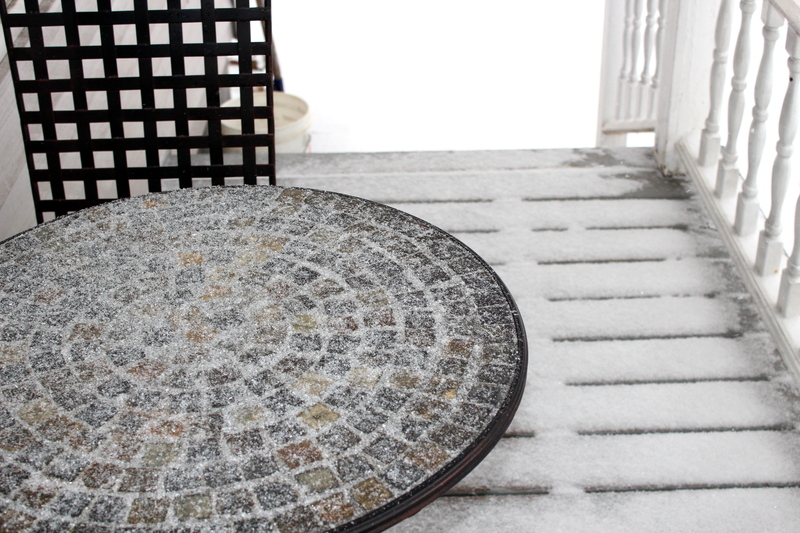 But, I’m happy to say that I think Spring is on its way now. After a base coat on all nails, I painted two nails Snow White, and the rest Sand Tropez. 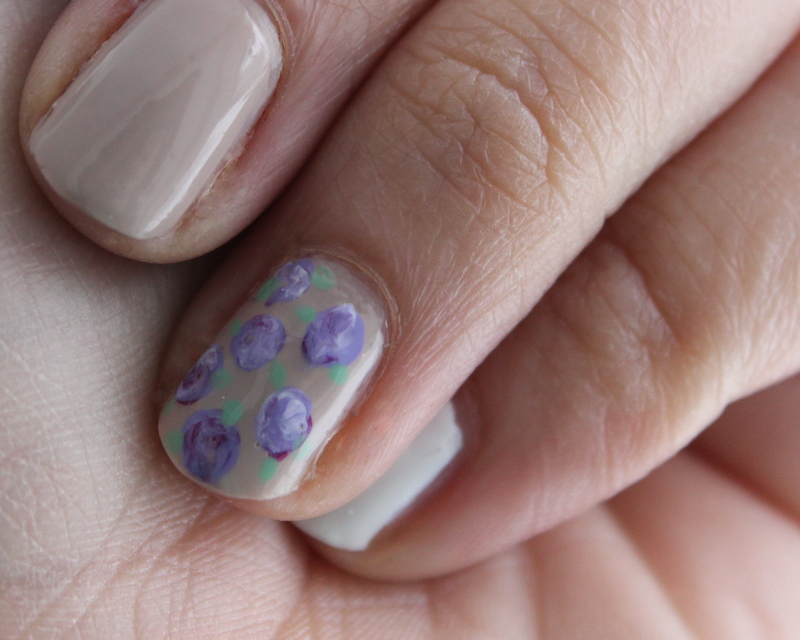 I chose to add little purple flowers on the ring finger and thumb nail of each hand. To create the flowers, I dropped a bit of Snow White, Raspberry and Tart-y for the Party on a piece of aluminum foil. 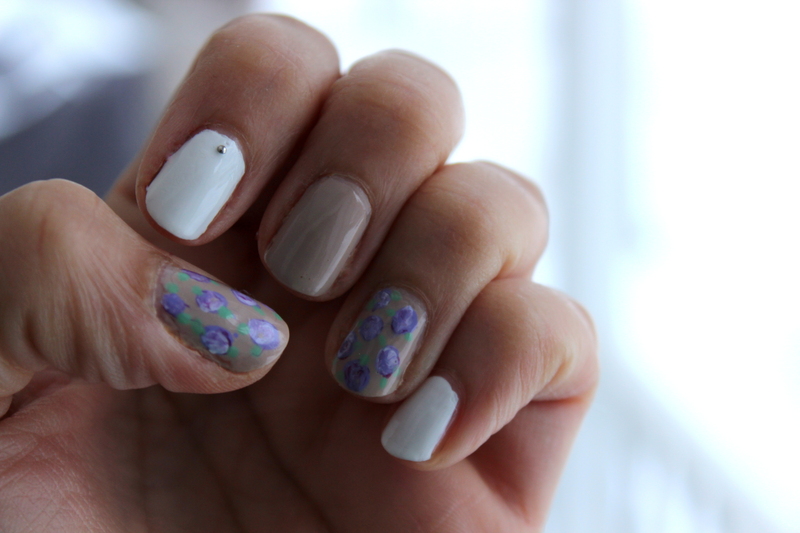 I then used a dotting tool to swirl the colors together and then dotted the swirled colors on my nail in various places to make the flower pattern. Sometimes, I’d add a bit more of each color to each dot to make it more or less white, or more or less purple, depending. You can find various tutorials on youtube for this. I then used a smaller dotting tool (you could also use a toothpick) to add little green “leaves” coming out from either side of each flower-dot. After it was all dry, I affixed a tiny silver stud to my index fingernail on each hand with a bit of topcoat, then added a coat of topcoat on all nails, and was finished! Let’s not talk about how awful my cuticles are right now. Actually, maybe we should talk about it. I struggle. If anyone has any recommendations for cuticle repair, I’d love to hear them!